DID I TELL YOU that I live in a village that has only 1500 inhabitants? If this were France, or Spain, or Italy, that wouldn't be a problem. But this is Eastern Canada and the eating habits of the locals are very conservative. Even the nearest city – Fredericton – is a big disappointment in the gourmet ingredient category. Therefore, when I see something fresh at one of the local supermarkets, I grab it. Which brings us back to Julia Child. I had had ratatouille in France – and frankly the quality was uneven – but it was in Mastering the Art of French Cooking that I learned the true secret of good ratatouille: all the ingredients must be cooked separately, so that they will remain recognizable. Mushy is not an option! Ah, but, what IS ratatouille? Where does it come from? What could be more evocative of the splendors of mediterranean cuisine than ratatouille? 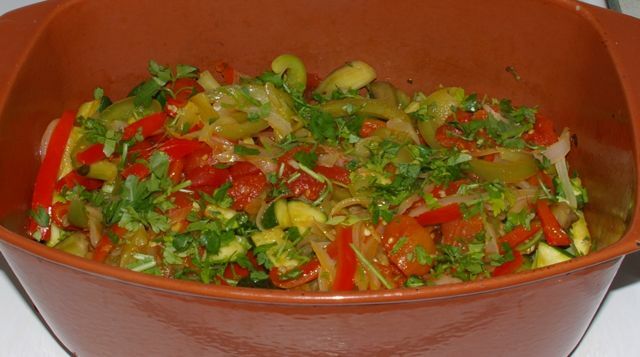 Ratatouille is a vegetable stew (tomatoes, eggplant, zucchini, peppers), sautéed separately or together in olive oil. One adds garlic, olives (ratatouille niçoise), sometimes onions as in Languedoc. The dish has spread all around the Mediterranean. And so the sicilian caponata [...] includes mushrooms, olives and a stalk of celery, the whole deglazed with a splash of vinegar. At its origin, in 1778, the word first designated a coarse stew, a coarse mixture. At the end of the 19th century, in military slang, the abbreviation "rata" designated a mixture of beans and potatoes, and, later, a mixture of vegetables and meat. It was only during the 20th century that the word ratatouille acquired the meaning that we give it today. The name is recent, the dish ancient, but what is it all about? It is amusing to look at its elements one by one and to determine their origin [...] which leads us to conclude that the dish could not have been invented before the 16th century, and probably during the 18th century. 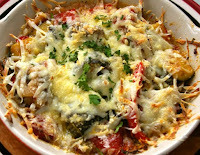 Click on the first link for a PDF document of Julia Child's ratatouille recipe from Mastering the Art of French Cooking. Ratatouille is really a summer recipe – for us here it would be at the end of the summer, when the eggplant and the tomatoes are at their best. This is a winter recipe, hence the canned tomatoes. Cut the zucchini into 1/2-inch slices (and the eggplant, if you're using them), in nice 1-inch by 1/2-inch chunks. Place them in a bowl and sprinkle with 1 or 2 tsp of salt, mix with the hands. Set aside and allow to sweat for about half an hour. 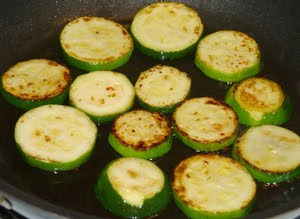 Heat some oil in a large frying pan and brown the zucchini (and eggplant) pieces lightly on both sides; transfer to a bowl. Cut the peppers into 1/2-inch strips and sauté in the same oil; transfer to the same bowl as the zucchini/eggplant. Slice the onions and cook in the oil until just beginning to brown; add the mushrooms and sauté them a bit, then add the garlic, the thyme, the parsley and sprinkle with salt and pepper. Cook the (optional) green beans in plenty of salted boiling water until they're still slightly al dente. Transfer to a large bowl of ice water to stop the cooking. Transfer all the vegetables, in layers, to a covered casserole. Drain the tomatoes to remove the liquid; chop them coarsely and pour them over the vegetables in the casserole. Cover and cook for 15 minutes, checking from time to time to keep the vegetables from scorching on the the bottom; adjust the heat if necessary. Continue cooking, or not, depending on how you wish to serve your ratatouille. AS SAUCE FOR PASTA: Ratatouille makes a very good vegetarian sauce for pasta; in fact, that's what I made this batch for. It's great with parmesan cheese! I like it fairly runny for this purpose. 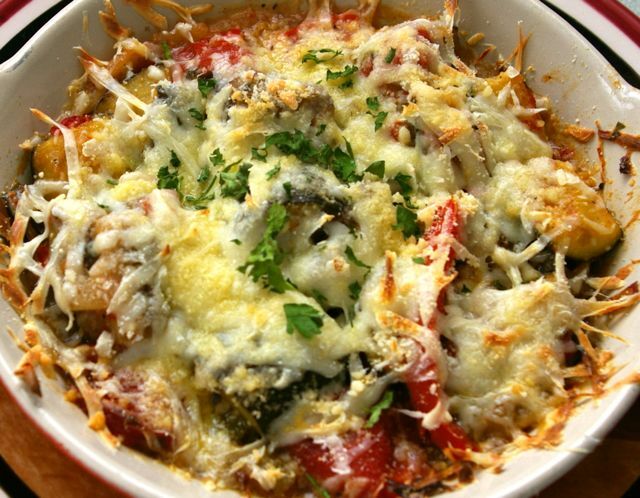 BAKED RATATOUILLE CASSEROLE: Top with mozzarella, parmesan, breadcrumbs, whatever you like; bake in the oven till the cheese begins to bubble and brown. RATATOUILLE TART: Continue cooking on fairly high heat to evaporate most of the liquid, or strain the liquid out. Let cool and spoon into a tart shell. Top with mozzarella, parmesan, anchovies, olives, whatever strikes your fancy. Bake. AS A QUICHE: Use a runny ratatouille and cool it first. Fill a partially cooked tart shell with the vegetables, pour over them a mixture of 3 eggs and 1-1/2 to 2 cups of cream (just to cover the vegetables; don't overfill); top with parmesan cheese. Bake at 375 degrees F (190 degrees C) for 25 to 30 minutes. AS A PIZZA TOPPING: Continue cooking on fairly high heat to evaporate ALL the liquid, or strain the liquid out. Spread on top of pizza dough, add mozzarella cheese, and bake according to your usual pizza recipe. AS A TOPPING FOR BRUSCHETTA: Raise heat until all liquid has evaporated (stir often to prevent burning) -- or strain the liquid out; grill a thick slice of French bread, or ciabatta, brush with olive oil and add ratatouille. AS A VEGETABLE: Goes great with lamb, chicken, beef – almost any meat that is simply grilled or or barbecued. AS A COLD SIDE DISH/FIRST COURSE: Don't forget that ratatouille is just as good cold as hot, and, like most stews, it's better the next day. I've seen instructions for cooking ratatouille in a crockpot, but what's the point? By the time you've finished sautéeing all the separate ingredients, your ratatouille is about 15 minutes short of being ready to eat! Reserve your slow cooker for dishes that benefit from a long, slow sojourn at a low heat. Peel and slice 6 aubergines and 6 Italian marrows (courgettes), sprinkle with salt and leave covered with a weighted plate for 1 hour. Slice 2 large onions, skin, remove pips and cut up 8 tomatoes. Slice 2 peppers very thinly, removing core and seeds. Chop 3 garlic cloves. Heat 1 cup olive oil in a heavy pan, fry onion until slightly coloured, add the garlic. Cook for 5 minutes, then add aubergines, courgettes, peppers and tomatoes. Season with salt and pepper, add a bouquet garni and cook, covered, for an hour. This dish may be served hot or cold. So much for cooking everything separately! So, which is the best ratatouille recipe? Yours, of course! NOTE: This French website has very good step-by-step directions for the preparation of ratatouille and you don't need to know French to appreciate the photos. 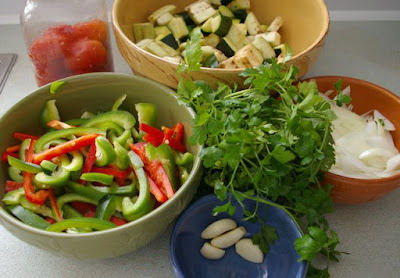 Hi Gina - Great ideas you have for using ratatouille. 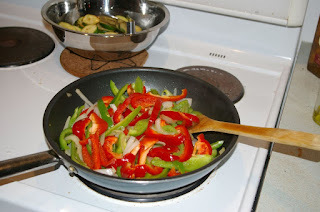 Personally I put the skillet on with some olive oil and start chopping and adding in this order: onions, bell peppers, egg plant, zucchini, garlic, tomatoes, herbs. If you go slow and sip a glass of wine, each step gets a little while to cook before you add the next vegetable. I know this is not a professional job, but I enjoy myself so my ratatouille tastes great. Thanks for the fun read and happy cooking! Hi Kim, like I said, the best ratatouille recipe is... yours of course! Boeuf Bourguignon Slow Cooker Recipe: This Is It! Ever Tried Making Your Own Cheese?